Difference between revisions of "Cleaning"
We'll start around 10:00a each day, but come anytime you can make time. See you soon! If you are in an area regularly, '''please consider bottom-lining that area.''' Only people who use an area regularly know what is good, and what is trash. We need those experienced volunteers to help others know what to do to improve an area. These volunteers experienced in an area are called "bottom-liners", meaning they are responsible for making sure it gets done. If you want to be a bottom liner, please publicly claim it in slack, . Bottom-liners should be here on saturday and sunday, for at least part of the day. They should develop a vision of what their space should ideally look like, and consider if they need new shelves/drawers/pegboards, etc to acccomplish that. If you need organizational hardware, post about it on slack and we can coordinate fundraising for it. Organizational hardware is equipment-fundable. Bottom Liners, please write a brief synopsis of what your plans are for your space, especially if you won't be here the full time to tell people. Please note: we will be purging and reclaiming projects and materials in the space. If you are storing anything in the space, this may affect you. See the details below. 1. Project Shelves Purge: If you have projects in the space, make sure they are identified as claimed by you with a date within the last month. Projects on the Project Shelves with a date older than ONE MONTH with no name will be reclaimed for the workshops and hack shelves, or be discarded. Projects on the Project Shelves with a date older than TWO MONTHs with a name will be reclaimed for the workshops and hack shelves, or be discarded. 1. '''Project Shelves Purge:''' If you have projects in the space that aren't on the lockers, fabric bins, or project shelves, please remove them. All items on the project shelves must have a recent (within 1 month) DO NOT HACK on them or they will be purged. 2. '''General all-hands Purge!!! ''': All DO NOT HACK tags elsewhere in the space expire the day the cleaning starts. Elsewhere in in the space, projects and materials labeled with a name and date older than ONE MONTH will be reclaimed for the workshops and hack shelves, or be discarded. As much as possible, projects will be moved to the project shelves. **Projects on the project shelves with tags >2 months old will be untagged and moved to hack shelves or Ewaste staging depending on judgement of person preforming purge. **Projects on the project shelves with tags >2 months old will be untagged and moved to hack shelves, Ewaste staging or dumpstered depending on judgement of person preforming purge. **Throughout the space projects with tags >1 months old will be untagged and moved to hack shelves or Ewaste staging depending on judgement of person preforming purge. **Throughout the space all personal projects will be untagged and moved to hack shelves, Ewaste staging or dumpstered depending on judgement of person preforming purge. On August 4 and 5 we are going to do some cleaning in the space. 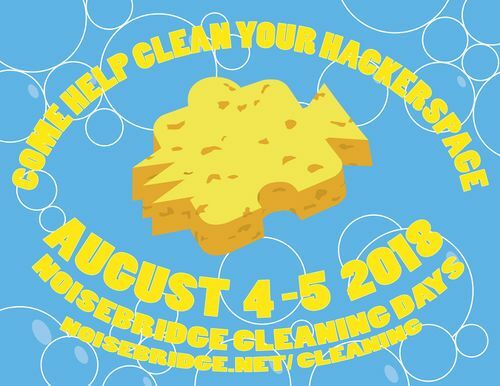 If would like to help clean your local hackerspace, please come on over. We'll make good use of your time, spend some time working with each other. Maybe we can even swing some refreshments. If you are in an area regularly, please consider bottom-lining that area. Only people who use an area regularly know what is good, and what is trash. We need those experienced volunteers to help others know what to do to improve an area. These volunteers experienced in an area are called "bottom-liners", meaning they are responsible for making sure it gets done. If you want to be a bottom liner, please publicly claim it in slack, . 1. Project Shelves Purge: If you have projects in the space that aren't on the lockers, fabric bins, or project shelves, please remove them. All items on the project shelves must have a recent (within 1 month) DO NOT HACK on them or they will be purged. 2. General all-hands Purge!!! : All DO NOT HACK tags elsewhere in the space expire the day the cleaning starts. Move #gnar sign to where the #gnar table is now. Secure the wobbly new lockers by the fabrication area.